Ha Long Bay is a popular travel destination known for its unique natural limestone and forest formations. While it is a popular destination, here are some tips to consider before visiting the area to make your visit fit your travel plans and expectations. Here are 8 things I wish I knew before visiting Vietnam‘s Ha Long Bay. 1. There’s more beyond Ha Long Bay. While Ha Long Bay is the most famous, it is overcrowded with tour boats compared to its neighboring Cat Ba region. The less crowded Cat Ba region may be a better choice to visit. The villages around the area are calmer and the beaches are clean, and trash free, opposite of the problems in the main Ha Long region. On the tour I experienced, our captain picked out a smaller island but we had the whole beach to ourselves. 2. The water in the region is extremely salty. If you plan to take a dip in the Ha Long waters, be prepared to swim in its extremely salty water. Make sure you bring along with you a small bottle of shampoo to wash your hair on the boat and a towel. I didn’t bring either of those items along, and my hair was a tangled mess for the rest of the day. 3. Don’t rush to book a tour online. Booking a tour online is convenient and easy, but you might not be able to get all the information about the tour that you want. All hotels in Hanoi offer a range of 1-day to 5-day tours to Ha Long Bay or its surrounding areas. If you have questions, the hotel representative will be able to help you answer them. Depending on the weather, tours sometimes will change the tour plan the day of. It is best to talk to the representative, ask as many questions as you want, tell them what you expect out of the trip, then pick a tour that suits your travel plans. Don’t worry about spaces being filled up, there are so many operators and so many tours every single day that depart from Hanoi. 4. Pick a tour in the medium price range. If you do some research on the tours, you will realize day tours can range from $40 USD to somewhere above $200 USD for a one-day Ha Long Bay area tour. If you are not on a tight budget, pick a tour in the medium price range. These tours can provide more comfort on the bus and the boat. These tours will also include a wide range of activities for the day. My day tour was around $90USD and the day included a relaxing cruise around the bay, lunch, kayaking into caves, and a swimming session on a remote beach. You will also meet other travelers on these trips as they try to keep the group small, and the nice thing is, you get to personally know and talk to the local tour guides. 5. Notify the tour of any allergies and if you’re a vegetarian ahead of time. 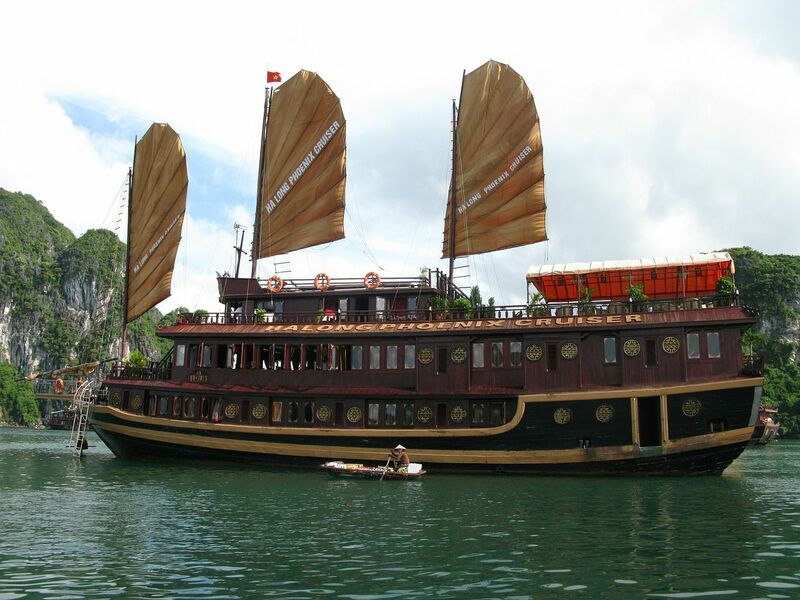 Most Ha Long tours include the lunch and dinner on the boat. The food is actually freshly prepared and cooked on the boat. Most boat tours will include at least seven to eight dishes for one meal, but few of them are vegetarian. On my tour, many of the dishes were seafood. If you have allergies to seafood or any other specific ingredients, you will want to tell the tour operator ahead of time. 6. It’s a long ride to get to Ha Long Bay. The Ha Long region is not as close to Hanoi as you think. Be prepared for a 3 to 4-hour drive to the region from Hanoi, and again the same to drive back to the city. Also, be prepared the night before by getting plenty of sleep as you will not be able to rest and sleep in the car or the bus. The road is extremely bumpy and windy. 7. Pack everything you think you will need. Because Ha Long is located in the tropics and weather can be unpredictable at times, you’ll never know what activities you may or may not end up doing when you get there. So pack smart! If you want to go kayaking, pack an extra pair of shoes. If you want to go swimming, make sure you bring along a bathing suit and a towel. Also, if you want to buy some local goods at the floating villages, bring some cash. 8. There is no reception in the Ha Long area. Be ready that you will not be able to use your phone for the day or for several days if you are on a multi-day tour. Don’t frantically try to connect to any social media platforms, going on Facebook or Instagram. Instead, kick back and relax and enjoy the cruise!